Adam holds a BFA from in Design/Tech from Sam Houston State University and an MFA in Design/Tech (emphasis in Technical Direction) from the University of Arizona. He joined the Baylor Theatre family in 2004 as the Assistant Technical Director and in 2006 he became a Technical Director. At Baylor, Adam has Technical Directed dozens of shows and has previously sound designed several shows for the department. Adam has also served as Technical Director for Pima College, Second Thought Theatre, Shakespeare & Co, Waco Children’s Theatre, and as a guest TD at the University of Arizona. 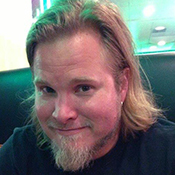 He has produced sound designs for Pima College, Tablerock Repertory Theatre, and Second Thought Theatre. Adam is also active in recruiting undergraduate students and giving workshops at state-wide recruiting events. Adam teaches classes in Metal-Working for the Theatre, Computer-Aided Drafting and Modeling, and Technical Theatre for Non-Majors. He also serves as one of the Building Emergency Coordinators for the Hooper Schaefer Fine Arts Center, and sits on the Committees for Laboratory Safety and Civil Rights Issue Resolution. Adam also runs the audio for most home basketball games for both the men’s and women’s teams. Adam is married to the beautiful and talented Toni Portacci and he has two amazing children, Jonas and Riley. The family is active in the First Presbyterian Church of Waco (Adam and Toni teach children’s Sunday school, and Adam is a Deacon) and they like to be involved in the community as much as possible. Adam enjoys playing guitar and fiddling with other instruments, listening to records, reading, and being outdoors.